on Thursday, 19 September 2013 at 1:30 - 4:30 p.m.
All provinces in Thailand are rich in local cultural heritages, especially in architectures and traditional ways of life. Their conservation is essential since they form parts of Thailand’s great cultural diversity, and are a source of knowledge and inspiration for future generations. Government agencies at national and local levels play an important role in the preservation of provincial cultural heritage. On the other hand, cultural bearers are indispensable. Each Community must take an active part in the conservation and the transmission of its own heritage to young people in the community. What is the role of local cultural heritage in the broader context of the Thai culture? What is its place in the rapid development of provincial communities? How can provincial communities, urban and rural, best manage and protect their cultural heritages? Case studies from three provincial communities will show the strategies and work structures that contribute to the successes or failures of their conservation efforts? How should different levels of government assist local communities’ conservation activities? What regulations are needed? What are the methods that can impress local communities with greater appreciation of the values of their own heritages? 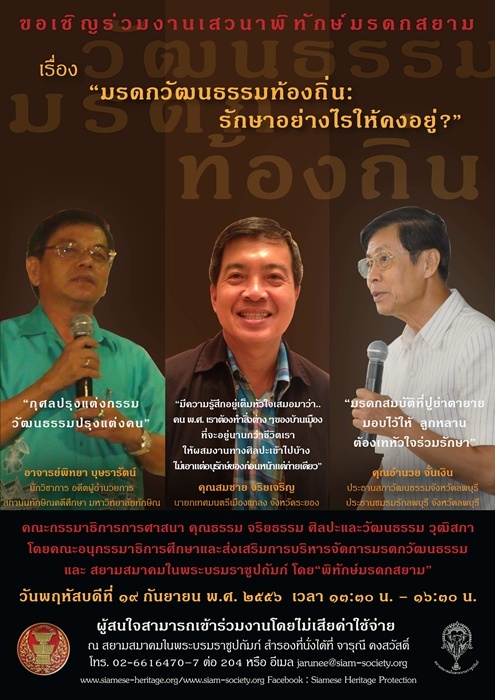 Note: This seminar will be conducted in Thai. It is open to public without admission fee. Sharing of opinions is open to the public during the seminar. As there is no intermission, food and beverage will be arranged for self-service during the seminar.